Farm fresh. All natural. Quality approved. USDA grade A. America's superior tasting egg! Can be part of a nutritious diet. High in vitamin E. 110 mg of omega 3. 25% less saturated fat than regular eggs. American Masters of Taste: Gold: Superior Taste. Vegetarian fed hens. Egg-land's Best eggs - awarded the gold medal for superior taste! We are proud and excited to announce that Egg-land's Best has recently been awarded the gold medal for superior tasting eggs in a triple blind judging by the professional chefs of the American masters of taste (the American masters of taste's judging panels are led by eminent American chefs. Their superior taste gold medal for eggs is awarded based on taste, appearance, yield and freshness). In addition to its superior taste, Egg-land's Best eggs are high in vitamin E, and contain 25% less saturated fat than regular eggs, as well as 110 mg of omega 3 fatty acids, and 225 mcg of lutein. How can an egg that has such great taste be so good for you? We only feed our hens a patented all-natural, all-vegetarian diet with no animal fat or animal byproducts to bring you the most nutritious and superior tasting egg we possibly can. Also, laying hens diets contain no added hormones. Egg-land's Best never uses antibiotics of any kind. 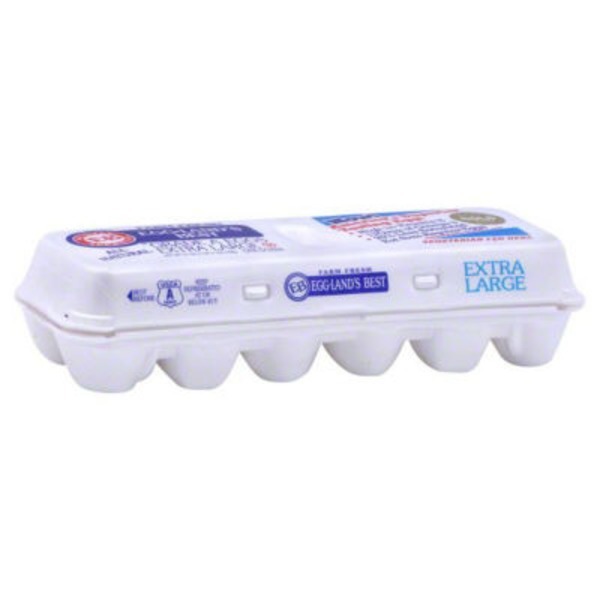 Now as you try to eat healthier, you can still enjoy one of your favorite foods, Egg-land's Best eggs! Recommended American diabetes association/American dietetic association dietary exchange: 1 Egg-land's Best egg for 1 medium fat meat. Saturated fat 25% less than ordinary eggs: 1 g vs 1.5 g (quantities rounded). If you are concerned about cholesterol, follow a diet lower in saturated fat and cholesterol and ask your doctor or dietitian about Egg-Land's Best Clinical studies. Produced in accordance with Eggland's best patented, all vegetarian hen feeding program. Eggs compatible with cholesterol reducing diet and method of producing the same. Grade A Extra Large Eggs. Keep refrigerated at or below 45 degrees F. Safe Handling: To Prevent Illness from Bacteria: Keep eggs refrigerated, cooks eggs until yolks are firm and cook foods containing eggs thoroughly.